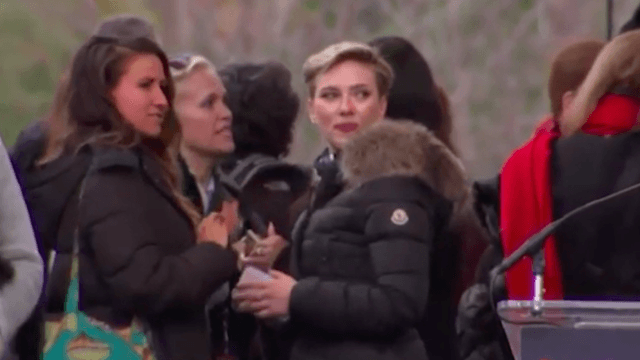 Scarlett Johansson didn't seem too thrilled when her speech at the #WomensMarch was cut short. Scarlett Johansson was one of many celebrities to address the #WomensMarch crowd in Washington, D.C., on Saturday. But unlike the speeches from Michael Moore and Gloria Steinem, hers was unexpectedly cut short, prompting confusion and some apparent annoyance from ScarJo herself. Johansson was focused on the topic of reproductive rights, recounting her personal experience with the healthcare nonprofit Planned Parenthood. At one point she beseeched President Trump not to deny young women the same "privileges" his own daughter Ivanka had. And then, as she was exhorting the crowd to volunteer and remain involved in the cause, music started up and her mic was muted. A few very awkward moments of confusion followed. Right now there doesn't seem to be any agreement as to why the speech was abruptly shut down—or if it was just some miscommunication that caused it—but suffice it to say, Johansson had a few more things on her mind.